The University of Mississippi School of Law became the fourth state-supported law school in the nation in 1854, almost ten years after the university opened its doors in 1848. The state legislature recognized a need for formal law instruction in Mississippi, and the “Department of Law” as it was titled, was established. Below is a brief history of the law school written by Michael de L. Landon, professor emeritus of History at the University of Mississippi. 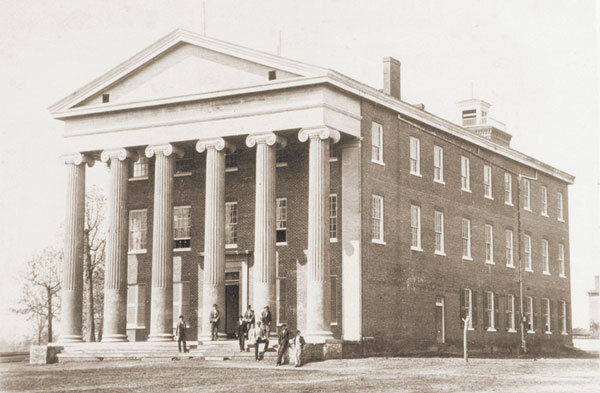 The first, seven-member law class of the University of Mississippi assembled in autumn of 1854 in a room in the Lyceum. By 1860, growing enrollment and a newly acquired law library purchased from the first law professor, Forbes Stearns, meant that more space was needed. In June of that year, a building on the northwest corner of the Oxford Square (where the Merchants and Farmers Bank is now located) was rented from Oxford banker William P. Avent to house the law program. Fortunately, the law library apparently was moved back into the Lyceum when the university closed at the outbreak of the Civil War, and so it was not destroyed when the buildings in the Square were burned down by Union troops in August 1864. By 1866, the law program was up and going again in the Lyceum under professor L.Q.C. Lamar. The first, seven-member law class of the University of Mississippi assembled in autumn 1854 outside the Lyceum. Although the program was suspended from 1872 to 1877 because of low enrollment, it was flourishing again by 1895. That year it was moved out of the Lyceum into the Old Northwest Dormitory, located near where Peabody Hall now stands, which it shared for the next 16 years with both the elocution program and the YMCA. The building, which had three floors, each with a balcony, was surrounded by tall shade trees and had been “nicely refurbished.” There, Thomas Somerville was elected as the law faculty’s first dean in 1905, serving in that capacity until 1913. By 1911, the law program had expanded to the extent that it needed a home of its own. That year, it moved into the neo-Gothic building, known today as Ventress Hall. That building had been erected 20 years earlier by the first law professor to become chancellor of the university, Edward Mayes. Serving as the university’s library, it was no longer large enough to continue in that capacity. In this new law school building, Leonard J. Farley served as dean from 1913 to 1921. He was assisted by one law professor and a number of local lawyers who came in from outside to teach. In 1922, the law school was accredited by the Association of American Law Schools (AALS) and, in 1928, the first volume of the Mississippi Law Journal was published. By the late 1920s, Ventress Hall had become too small to accommodate both the growing number of law students and the ever-expanding law library. In 1930, however, the school had already moved into a newly built home over on the other side of the Grove, which was named Lamar Hall but was generally referred to as “the law building.” Built as a law school, this building had offices for instructors, ample classroom facilities and a moot court room. During the deanship of Robert J. Farley (1946-63), the building was expanded in size, and it is known today as Farley Hall. In 1963, Joshua Morse III became Dean of the law school. He hired as law professors a talented group of young Yale law school graduates who along with the students provided legal assistance to the poor. Also in 1963, the second African American student admitted to the university, Cleve McDowell, was approved for admission to the law school. He was roommates with James Meredith, who integrated the university in 1962. After Meredith graduated, the federal troops that had protected him for the last year were no longer on campus. McDowell requested permission to carry a firearm and was denied. He asked for better protection, but continued to carry a small handgun. As he was running up the steps of Lamar Hall late for class, he dropped his sunglasses. When he bent over to pick them up, the gun fell out of his pocket. He was arrested and expelled for unlawful possession of a firearm. By the fall of 1966, fourteen African American students were enrolled at the university including Reuben V. Anderson, who became the law school’s first black graduate in 1967. Constance Slaughter Harvey became the first African American female graduate of the law school in 1970. During her time at the university, she founded the chapter of the Black Law Students Association. She also served as the only woman on BLSA’s inaugural National Board of Directors. Under Dean Morse’s leadership the law school became a focal point for social change. He fought against discrimination and racism, and students were exposed to a more expansive view of the nation and world. Dean Morse left the law school in 1969 to become Dean of the Florida State University law school. In 1978, the by-then greatly expanded law school, now known as the Law Center, moved into a new building eastward across the parking lot from Farley Hall. This Bauhaus-style building, which represented a departure from the red brick and columns of the Greek revival style in which most of the buildings on campus had been built, became known as the Lamar Law Center. Eventually housing the law school, the Eastland Law Library, the National Center for Remote Sensing, Air and Space Law, the National Center for Justice and the Rule of Law, the Mississippi Judicial College and the American Academy of Judicial Education, the center was the law program’s home from 1978 to 2010. In January 2011, the law program moved into a new home named for Robert C. Khayat, a law professor who had served as chancellor of the university from 1995 to 2009. A LEED-certified building located on the south end of the campus and designed with students’ needs in mind, its architecture blends in well with the beauty of the Ole Miss campus. The University of Mississippi School of Law remains Mississippi’s only state-supported law school.